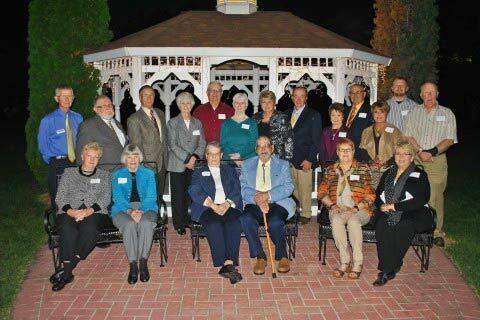 The Black Hawk College East Foundation honored both those who gave and those who received at its annual scholarship banquet in October at Lavender Crest Winery in Colona, Illinois. Welcoming benefactors, scholarship recipients and their guests, college and foundation leadership, faculty and staff were Steve Spivey, chair, and Doug Parrot, vice-chair, of the Black Hawk College East Foundation Board of Directors; Liz Breedlove, executive director of the East Foundation, Dr. Bettie Truitt, president of Black Hawk College; and Betsey Morthland, interim executive dean of East Campus. "The mark we leave on the world and how we are remembered will be different for each of us," Dr. Truitt said. "I am thankful that the mark you [benefactors] have chosen to leave will be found in the hearts and minds of these young people and reflected in their accomplishments and contributions for many years to come." Sharon Deahl explained the origin of the Kewanee Area Business Women’s scholarship and the organization’s commitment to women re-entering the workforce, enhancing or changing their career, or just beginning their career. "It only seems natural that we would support higher education for women, and the quality of the education that is received at Black Hawk College is second to none," said Deahl, president of the Kewanee Area Business Women’s club. "Black Hawk College is a true asset to this area, and I am certainly proud to be a part of that," she said. Since 1968, the KABW, formerly Business and Professional Women (BPW) has funded 38 scholarships to nontraditional female students at the East Campus. For the 2015–16 school year, the Black Hawk College East Foundation awarded 88 scholarships totaling $80,835 to 65 students (view recipient list). The foundation maintains 90 scholarship funds with assets of more than $2.1 million. With additional spring scholarships yet to be awarded, the BHC East Foundation is on track to award more than $100,000 again this year. The foundation has awarded $463,326 in total scholarship support to East Campus students over the last five academic years. "Thank you to the benefactors who made these scholarships possible... for your generosity, your friendship and your legacy of higher education that you have bestowed on our students, the Foundation and the college." stated Liz Breedlove. The students shared their reasons for selecting Black Hawk College and detailed how the scholarship monies are assisting them in pursuing their career goals. "All the credit is due to our generous benefactors. It gives me inspiration to keep going," said Shannon Hernandez of Kewanee, Illinois, recipient of the 25 for 25 Scholarship. "Without you, people in my situation wouldn’t have these wonderful chances."